This week I have been working on shades of brown.This first one is 3 strands of satin brown seed beads with pale topaz round Swarovski crystals and a beautiful piece of picture jasper. The jasper looks like a miniature landscape painting. Sold. These little dainties go quickly. Every time I make them they are gone by the next weekend. They combine pale blue teardrop agates with satin brown seed beads. I am now out of the seed bead so these will be the last of this style. Update: Both of these sold on Friday! And for the finale, a beautiful piece of chocolate jasper hanging from strands of golden bronze, gold and smokey topaz glass seed beads. Accents are rich topaz Swarovski bi-cone crystals. Sold. 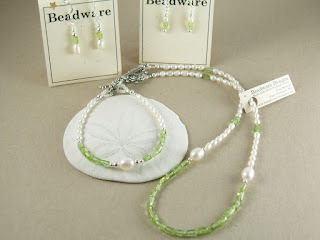 More new items you will see if you come to the Port Ludlow Festival by the Bay this weekend. You will find me in a booth next to Blue Fox Glass. Moss agate, crystal and glass. Sold. The last of my green opals mixed with copper, glass seed beads and small green opal. This has sold. Similar to above but with crystals. This one has sold. More moss agate with crystals and a Bali sterling silver bead pendant. Sold. Now it is time to go pack the car for the weekend! Yesterday and today I have been busy restocking. Here are the latest items off my workbench. Next up will be blues and browns. Things are going fast this summer so don't wait to see it listed in my online store. Just send me an email if you see something here you would like. A new earring style in multi-colors, grey-blue, brown and matte black. Some plain silver earrings. These usually go quickly! And three new necklaces. I am nearing the end of my green ocean jasper. This one is a mix of black and grey Swarovski crystals and Czech crystals. Sold. 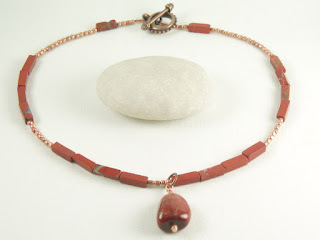 And one more ocean jasper mixed with copper. I like the new copper beads.This has sold. This week I was busy getting ready for Lavender Faire in Sequim. This event is 7 festivals in one! Tickets/buttons are $10 in advance and $15 on site. The button gets you into 7 farms and a free ride on the farm bus (or you can drive yourself). You will find my booth, as well as Blue Fox Glass and many other vendors, at Olympic Lavender Farm. Purple Glass Garden bracelets. All have sold. Two fancy jasper necklaces. Both now sold. Assorted purple glass bead bracelets. Swarovski crystal earrings in purple and blue. Very sparkly! Ruby, carnelian and peridot (for the sign Leo) are birthstones for July. Carnelian is a variety of chalcedony. Sold. Healing ability: Believed to help heal physical wounds, cure blood disorders, treat sexual disorders, and to stop bleeding. Mystical power: A protective stone said to open the second (sexual) chakra to promote passion, creativity, motivation, self-confidence and self-esteem. It bestows clarity and is a powerful alley to those who procrastinate or are unable to make decisions easily. It helps to clear away negative thoughts and habits. Peridot is symbolizes fame, dignity, and protection. It is the gemstone for the 16th year of marriage. Disclaimer: This "stone trivia" is provided for curiosity only and is in no way meant to be medical advice. This past Friday I entertained an out-of-town friend. After picking her up at the airport she accompanied me to the Puget Sound Bead Festival and she helped me pick out some cool new metal beads and stones. I found some very interesting metal beads this year as well as some deals on large bags of pewter beads that I could not pass up. In fact I wish I had gotten more! And now for the stones. My mission was blues and greens. The blue ovals are Dumortierite from South Africa. This blue crystal is a birthstone for Virgo (Aug 23 – Sept 22). It stimulates the brain and brings enhanced intellectual abilities. It assists with all mental skills especially mathematical and language. It is a useful aid for anyone who is studying as it assists the retention of information as well as enhancing your will power, and capacity for self mastery. It helps to stabilize emotions, increases your patience and helps you take control of your life. Here is your geology lesson for the day......The green stones on the right are called Kambaba Jasper (also called crocodile jasper), a rare fossilized jasper from Madagascar. It is a stromatolite jasper, which means that it is composed of fossilized algae. Stromatolites, colonial structures created by Cyanobacteria (commonly called blue-green algae) are among the oldest fossils on earth, being found in rocks over 3 billion years old. Cyanobacteria form these mound-like structures by growing through sediment, binding the particles together resulting in successive layers which, over very long time periods, may harden to form rocks. These structures may be from fractions of an inch to several feet in diameter. Cyanobacteria were the dominant life form on Earth for over 2 billion years. Today they are nearly extinct, living a precarious existence in only a few localities worldwide. Although many Stromatolites are fossils, there are a number of locations on the modern-day Earth where Stromatolites are still forming. Kambaba Jasper calms emotions and brings balance and relaxation, and like all jaspers, it is a stone of protection and grounding. Promotes rational thinking and teaches the wearer to have empathy with the feelings of others. Aids in the ability to deal with difficult situations and helps turn thoughts into actions. It also works on stimulating creativity whilst encouraging self discipline to complete endeavors or projects which have lost their original excitement. In a healing capacity it aids the circulation and digestion and detoxifies the blood. And the square stones in the middle are Fancy Jasper. Also known as Indian Agate, it promotes well-being, channels positive energy, strengthens boundaries and helps to release obsessions. It calms the mind and helps one to focus and make positive plans for the. It has the ability to nourish the mind, body and spirit and therefore brings balance in to ones life. It helps to organize ones thoughts and promotes rational thinking. We both fell in love with these and they were the last two strands the dealer had. This is Red Dragons Blood Jasper. What a name! This stone is from Australia and like all jaspers it is a member of the quartz family. It brings joy to community interactions. It increases courage & strength and promotes heart healing. Did you know that 2012 is the year of the Dragon? After all that shopping we were ready for lunch at Indochine on Pacific in Tacoma. I have eaten here several times and highly recommend them. A relaxing setting with delicious and beautifully prepared food. Later in the day, after moving some furniture in my house, we went through the outfits she had packed for her cruise and I made her jewelery to match. A new magic jasper necklace and earrings. A pair of turquoise and pearl earrings to go with a necklace she has of mine. And a pair of grey pearl and copper earrings to go with a necklace with the same materials. You may see some of the later from me soon as I really liked them. Stocking up for this weekend. If they make it through the next few weekends they will get into my online store. Or if you see one you like just shoot me an email and I will set it aside for you. An agate teardrop, rounds of sesame jasper and iolite with a pewter toggle clasp.Sold. Sapphire blue chalcedony, seed beads and silver plated accents, chain and lobster clasp. Sold. A grey agate with matte black glass seed beads and silver plated accents, chain and lobster clasp. Sold. Two more grey agates. The one on the left also has grey Swarovski crystals. Both have sold. Pale green chalcedony with a sterling silver bead cap. Grey-green glass seed beads, silver plated accents, chain and lobster clasp. Sold. Pale blue agates mixed with satin brown glass seed beads. Silver plated accents, chain and lobster clasp. Sold. This new sun catcher design has been popular and after last weekend my inventory of is getting low. So I whipped up a few dozen new ones. They are made with antique, Czech and Swarovski crystals and assorted charms. Deep dark red, clear and orange. Green with a dragonfly and blue with dolphins. Browns, orange with a flower, purple with hearts, grey with a dragon (cool!) and pink with a flower. another purple heart and pink with a flower. The view last eve was of dancing!! There is a very fun series happening in Seattle Parks this summer called Dancing Till Dusk. 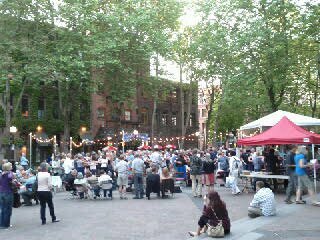 Last eve they were in Occidental Park in conjunction with First Thursday Art Walk. The band was Kevin Busters Lunch Money and they played swing and blues. The first hour was swing lessons. As you can see from the picture the dance floor was packed with eager newbies. It was very entertaining to watch and listen and I bet even more fun to participate judging from the huge smiles and laughter. Check out the link for dates and locations and get your dance on! !